Choose Size: * XLarge (600) 24" x 31" Giant (700) 31" x 44"
Choose from XL 24″ x 35″ / Giant 33" x 44"
Did put 2 pads together like a pillow case, as suggested by Dryfur. Used the adhesive strips to attach one pad onto the other, which was quicker than sewing the pads together. The Dryfur Pet Carrier Inserts don't come large enough for my dogs' kennel sizes, but the largest size was the perfect insert for the 'Travel Pad Pillow'. This made the Pad more sturdy and provided a comfortable 'bed' for my dogs to rest on during their flight. I flew my dogs across the Atlantic for relocation purpose. But if I had to fly my dogs again, I would order these pads plus the Dryfur Inserts again. Traveling long way overseas to Germany with doggy daughter in 500 series kennel. DryFur pads don't come in that size. Dry Fur recommended making a pillow case out of these blue breathable ones. My wonderful sister made two pillow cases - one for each leg of the trip. We put her crate bed in the "pillow case" and also added the kennel sized white absorbent travel pad between the bed and pillow case. (Packed the 2nd set to change out at layover.) It didn't keep things completely dry but my girl was dry, and it was easy to change out the bedding and prepare for the next flight. I will say the blue travel pads would not do much on their own for a larger animal or long flight. But they did make a good barrier. And the white absorbent pads were absorbent, and also soft. I actually ordered them in the smaller size to wrap around the DryFur pads in my cats' crates (as the DryFur pads are excellent but a little stiff). 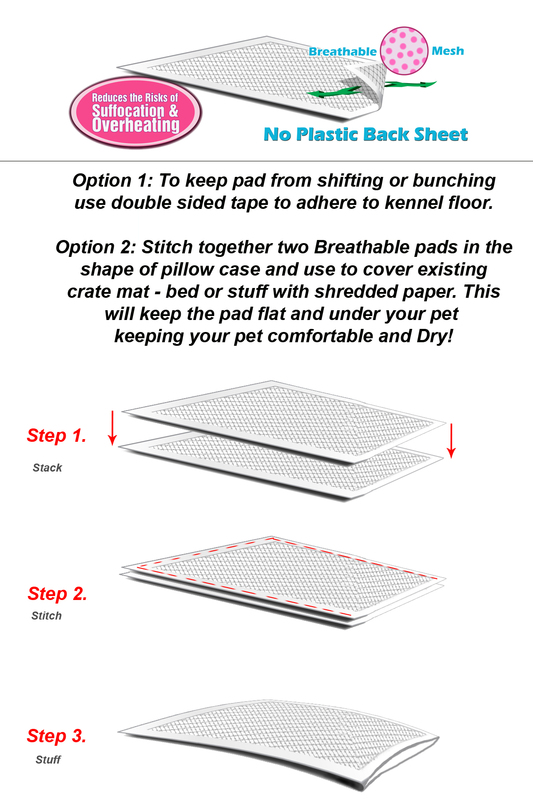 These haven't been put to the test, yet, but I did as suggested and stitched them into "pillowcases," filled with super absorbent travel pads from this same website for cushion and more absorption. The cats approve, and have been happily trying out just resting on them in the carriers. I didn't realize these would be so thin, or I would have ordered more and stitched them together like they suggest on this page. I don't know how absorbent they are yet, but they fit nicely into our Giant 0700 kennel for our dog. They fitted very well with dogs giant crate. There no water spills or urine matter. The pads had sticky strips that kept them in their place during travel. Keeps your baby clean and dry! My big Cane Corso hates mess, so I was worried about how I would transport her to the other side of the world when I moved to Saipan. These pads worked great. I used two to make a sleeve to cover a crate pad. She arrived happy and dry after over 20 hours in the crate. Perfect size and very comfortable.